Composer is incredibly proud of stage musical inspired by 1977 album now playing in Toronto. Songs that were written by Jim Steinman four decades ago for a college project have lived on, first on the 1977 Meat Loaf album Bat Out of Hell, which has sold at least 34 million copies worldwide, and now in the stage musical playing at Toronto’s Ed Mirvish Theatre. The star talked to Steinman, the American composer and producer who has also worked with Bonnie Tyler, Barry Manilow and Céline Dion, about Bat Out of Hell. Describe the place you were in, in your life when you wrote Bat Out of Hell 40 years ago? Bat Out of Hell was born out of my Amherst College senior project called Dream Engine. That project shares DNA with Neverland, a project that came after it, which we performed at the Kennedy Center in Washington, D.C., and they both are related to Bat Out of Hell The Musical. Forty years ago, when I began my career in theatre, I was someone eager to push the boundaries of what is possible and I wanted people to feel something when they saw my work. Nothing has changed. I feel exactly the same today. Did you always intend for the songs to become part of a musical? If so, any thoughts on why it took as long as it did? The songs started onstage and I’ve always felt their home was onstage. Things take a long time for a lot of reasons: I had a successful career in the record business as a writer and producer; I worked on other theatre like Whistle Down the Wind with Andrew Lloyd Webber and Tanz der Vampire with Roman Polanski (which just had it’s 20th anniversary show), and it took some time for what was possible onstage to catch up to my vision. What are some the themes or ideas that you incorporate into your music? What part of the process do you find most enjoyable, writing lyrics or music? Lyrics are easy for me, but when the music comes it comes in a flood. Have you seen the show? What is your assessment? I’ve had the opportunity of viewing the show and I’m incredibly pleased and proud. Jay Scheib is a fabulous director: intelligent and fearless. The entire cast, crew and creative team gave their very best. I find the show spellbinding, groundbreaking and incredibly true to the songs. 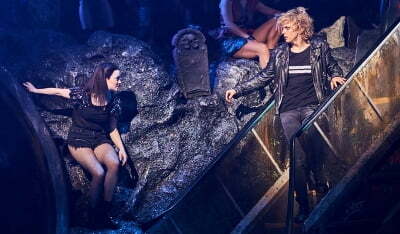 Award-winning Andrew Polec, the show’s extraordinary lead, carries on Meat Loaf’s legacy. For things to be timeless, they have to span the generations, torches have to be passed. Bat Out of Hell The Musical is part of something timeless. Is rock music still as relevant as it once was? Is it still the voice of rebellion? Youth is the voice of rebellion and rock is the music of youth. If something feels jugular, then it’s relevant — more than relevant; it’s life and death. That’s where I live. That’s where rock lives, where rebellion lives and, most importantly, where youth lives . . . glowing like the metal on the edge of a knife.